To compensate for the sympathy card that I had in my last post, I thought I would bring you something bright and cheerful today! I decided on this card to experiment with lots of layers. This is something that I have noticed Dawn McVey is doing a lot on her blog and I just love the looks that she is able to achieve. I started out with a Papertrey Ink Harvest Gold cardbase and added a strip of patterned paper from my stash to ground it out. The doily is from a package of 30 that I bought in the baking section at Joann's. The next layer is PTI's Tag Sale 4 die in Raspberry Fizz. 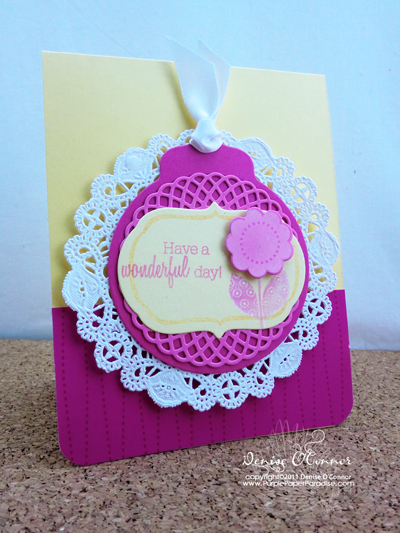 Then we have a die from Delightful Doilies collection in Hibiscus Burst. I then used the die and stamp from Fillable Frames #8. Since PTI has not released Harvest Gold ink, I substituted Distress Ink in Scattered Straw. I then got out PTI Flower Fusion die and stamp set. I cut out the flower on Hibiscus Burst cardstock and stamped in Fresh Snow. For the stem, I actually double stamped it, first in Fresh Snow and then in Hibiscus Burst. The sentiment is also from Flower Fusion 1. Add a ribbon through the hole on the tag die, round the bottom corners and we are all set. This card was super quick and I think that this layout will be used again! Fortunately I don't need a sympathy card right now, but it always seems that when I need one I don't have one available and there is little time available to make one. I decided to have one in my stash so that the next time I make one, I have it available. 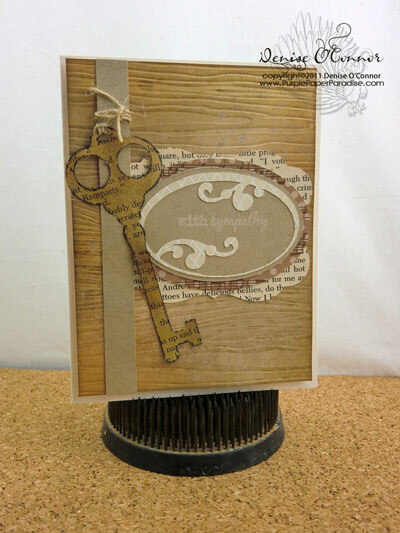 The key is from the Lettering Delights Keys SVG set and I cut it out of vintage bookprint. I used my Copic markers to airbrush it to age it even more and then I spritzed it with Heirloom Gold Perfect Pearls mist. The frame is from the Lettering Delights Love Labels set. I just removed the layer that had the lovey sentiment on it and then deleted one of the oval layers. All of this cutting was done with my eCraft using Make the Cut. The woodgrain paper is Papertrey Ink Vintage Cream cardstock that was impressed with their Woodgrain impression plate. I then distressed it with Distress Ink (colors Vintage Photo, Frayed Burlap and Tea Dye) and then spritzed it with Heirloom Gold Perfect Pearls mist. Lettering Delights SVG cuts in the eCraft! Did you take advantage of the big super sale of SVG files from Lettering Delights a couple of weeks ago? You know I did! For today's card I used two SVG sets that I got through the bundle. The frame is from Felt Owl Right and the funky scalloped border is from Scalloped Borders. By the way, if you missed out on the bundle, Dollar Days are happening right now and all SVG sets are $2. Quite a deal! By the way, this is a new color combination for me. I challenged myself to use a color that I normally don't use very often. In this case it is Papertrey Ink Melon Berry which I paired with PTI Aqua Mist and Smokey Shadow. I really like this combination! It just goes to show you that sometimes working outside of your comfort zone is a good thing! The sentiment stamp is from PTI Signature Greetings. The frame is set up as a two layer frame, and in mine I actually have three layers. That is because Make the Cut makes it so easy to make shadow layers! Love that with a few clicks of the mouse, you can completely change the look. It's has been quite awhile since I have posted anything and I am sorry about that! Our household got hit with bronchitis. One right after the other, all of us got it. Finally we are all feeling better now! For about a week, I was so weak and fatigued that creating something in my studio was out of the question. I just recently got around to playing with some of the stamps from Papertrey Ink's February release. Here is a very simple, easy to mass produce card. Don't you just love that purple? It is the newest PTI color called Royal Velvet and I am in love with it. I also decided to send my eCraft in for the firmware upgrade and I am working on putting together a review of the upgrade which I will post in the next few days. In the meantime happy crafting everybody!